A delegation from the Fulham Supporters’ Trust visited West Bromwich Albion’s training ground on Friday afternoon to present Roy Hodgon with a small gift as a thank you from Fulham’s fans after his successful spell at Craven Cottage. 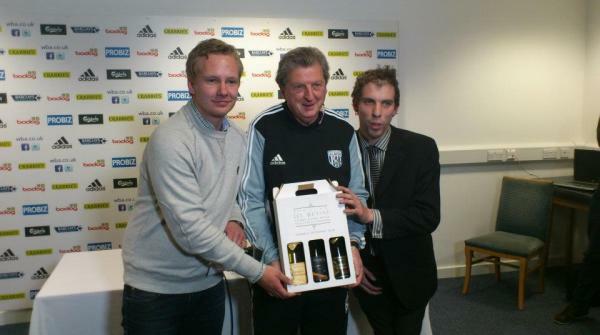 Members of the Trust organised a collection after Fulham reached the final of the inuagural Europa League in May 2010 and the Trust subsequently purchased a case of wine from Neuchatel, where Hodgson managed successfully earlier in his career. The Trust also produced a DVD of Hodgson’s best moments at the Cottage, featuring Fulham’s great escape from relegation in 2007/08, the team’s rise to a seventh place finish the following season and the remarkable run to the final in Hamburg the season after. Both of these mementos were presented to Roy Hodgson prior to his press conference ahead of the weekend derby with Aston Villa. The Fulham Supporters’ Trust would like to thank West Bromwich Albion Football Club, the Club’s Director of Communications Jonathan Simpson, and Roy Hodgson for their kind hospitality and wishes both West Brom and Roy Hodgson the very best for the future.